An old-time general store providing natural foods, yarn and knitting supplies, antiques, plants, gardening supplies and more local products. High Meadows Farm produces and sells daffodils, blueberries, vegetables, pumpkins and ornamental gourds. We have rare and unusual daffodils in the spring, blueberries and vegetables in the summer, pumpkins and gourds in the fall. Come and tour the farm! General groceries, sandwiches, gas, camp wood, ice, folk art and more! 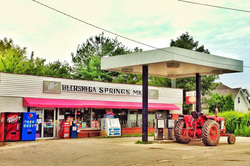 ​Convenience store, lunch counter and adjacent hardware store. American owned and family operated, Northcutt's prides itself on its family atmosphere. They offer sandwiches made with Boar's Head meats, and a wide variety of hot foods as well as a complete line of groceries and other essentials. The Friends of South Cumberland has not evaluated nor accepts any responsibility for the information or services provided by these establishments. The information shown here is provided as a matter of convenience for park visitors, and to help promote locally-owned businesses near the park.